Hobbyists, makers and Arduino developers that also enjoy the odd cocktail might be interested in a new robotic bartender called the Bar Mixvah. The Bar Mixvah is powered by an Arduino micro-controller that uses a series of pumps to pour your perfect cocktail, whatever it may be. 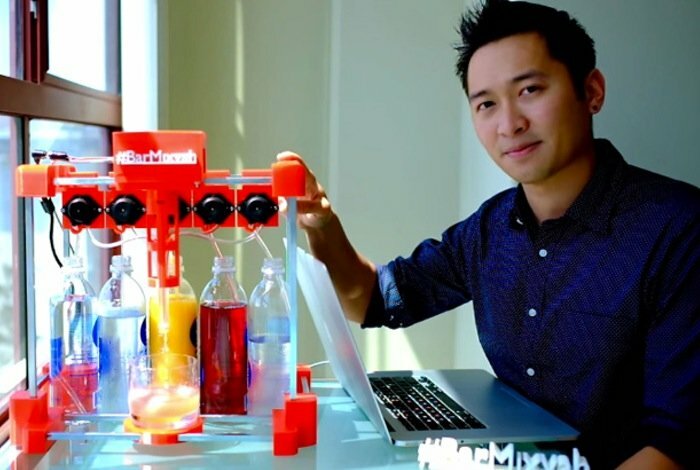 Check out the video after the jump to learn more about the robotic bartender from its creator Yu Jiang Tham. Yu Jiang Tham provides full instructions on how you can build your very own just like it, as well as publishing all the 3D model blueprints you will need to 3D print the custom plastic parts that make up the structure of the Bar Mixvah robotic bartender. “Within Bar Mixvah an Arduino microcontroller switches a series of pumps via transistors on the physical layer, and the MEAN stack (MongoDB, Express.js, Angular.js, Node.js) and jQuery for the frontend and backend”. “Bar Mixvah is designed to use a system of 5 peristaltic pumps that are switched by 5 bipolar junction transistors (TIP120), all controlled by an Arduino, which itself is controlled by the Johnny-Five package on the node.js/express web server that is running on your laptop/windows tablet” explains Tham. For full instructions on how to create your very own Bar Mixvah robotic bartender jump over to the Yu Jiang Tham website for full instructions and a list of everything you need to build your very own. If you liked this you might also be interested in building an Arduino wind speed meter which offers an easy way to start tracking wind speed using an Arduino Uno.